Cherry Knits: "Well-behaved women rarely make history." Happy March! It's also Women's History Month. The quote is by one of my favorite historians, Laurel Thatcher Ulrich. 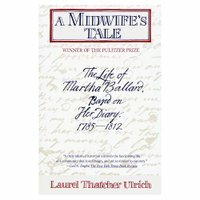 She won the Pulitzer Prize for History in 1991 for A Midwife’s Tale: The Life of Martha Ballard Based on Her Diary, 1785--1812. A few years ago there was also a wonderful PBS documentary based on the book. Check out more at this fascinating website: www.dohistory.org. Other works include: The Age of Homespun and Good Wives: Image and Reality in the Lives of Women in Northern New England, 1650-1750. And on a realted subject near and dear, check out No Idle Hands: The Social History of American Knitting , by Anne Macdonald. Wishing you your place in history - - and if you are of the female persuasion, misbehave whenever possible! I love A Midwife's tale. Isn't it a great book. I gave to to my MIL a few years ago I loved it so much, and knew she would too. Thanks for the recommendations, I'll have to check some of those out. BTW- I'm the Yarn Queen's Daughter, she told me to check out your blog. Very Fun. I had to read Midwife's tale for a class and while I found it fascinating it is also a bit of a tedious read (or maybe that is just me) I have to admit to skimming at times. Happy women's history month -- let's keep making it!! I love A Midwife's tale. Isn't it a great book.